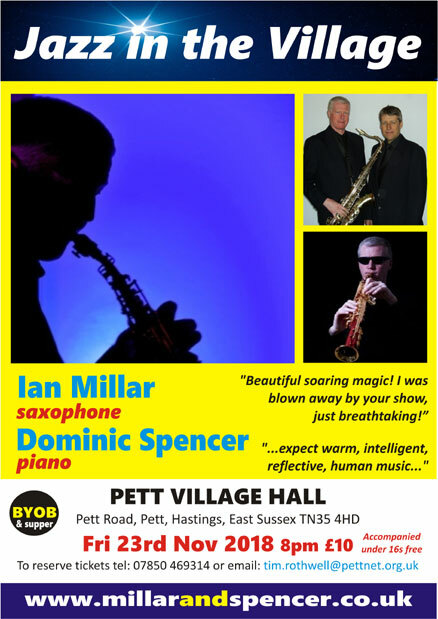 An evening of high quality, sophisticated, melodic jazz with the emphasis on improvisation with Ian Millar – saxophone and Dominic Spencer – piano. Ian and Dominic play all around the UK and have recently undertaken a highly successful season at the Edinburgh Fringe. Bring your own supper, wine etc. Pett Village Hall is situated next to the Two Sawyers pub on the Pett Road. There is ample parking. Book tickets in advance from Tim Rothwell at tim.rothwell@pettnet.org.uk – pay at the door.